Kayak fishing is a growing sport that offers a different perspective to fishing, than traditional angling from a boat with a motor or shore fishing. For some anglers, it offers a relatively inexpensive means of transportation to get out on the water, offering some great opportunities while capturing fantastic views and offering a challenge to catching fish. Rod Glove Pro Staff, Steve Haines from New Zealand got into salt water kayak angling about 5-6 years ago. He indicated that Ocean Kayaks or yaks are outfitted with fish finders, GPS plotters, fish storage bins and each angler wears a PFD, VHF radio and PLB (personal locator beacon). Steve generally goes out fishing with his friends but often they end up in very different spots and at times a distance apart. "One of the key advantages of yak fishing is that we generally fish in stealth mode and can fish shallow water very quietly unlike in a boat." Steve says that 'a typical Saturday morning fish' would see us launch off any one of the local beaches and then they could head 3-5 kms (2-3 miles) off shore fishing local bays and islands. Steve says the biggest challenge is getting to the fishing location as kayakers are under "paddle power"...with no motors. 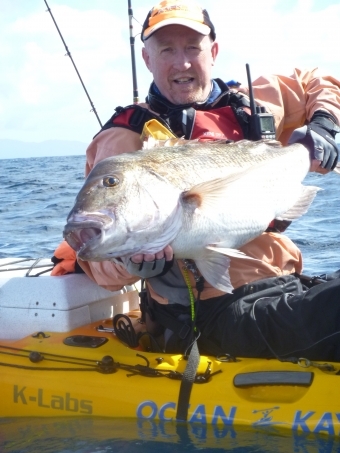 The other challenge faced by kayak anglers is actually landing a big fish. As he explains "unlike a boat where you can lock up the drag on a reel and leverage against the boat, in a kayak, the kayak itself becomes the drag. And big heavy gear is a liability because you can't physically use it...lock the drag and you can get pulled in." And, he uses The Rod Glove products to protect his fishing gear! I transport my kayak with a fibreglass trailer that has been heavily modified with a false floor where I store my Rod Glove protected rods. "I use The Rod Gloves to protect my musky rods which average around 9' in length as I don't want my leaders to bounce around on the graphite section of my rods. I know my rods are going to be protected from scratches." From pitching to visible shallow water targets like laydowns or boat docks, to making casts to isolated weed clumps or fishing a weedline, a Texas-rigged soft plastic bait is so versatile that is a must for any bass angler any time of year. Shop online for your favourite fishing protection gear from The Rod Glove.